Day Twenty Eight, Del Norte Coast Redwoods State Park to Colusa-Sacramento River State Recreation Area. After an extremely long day of driving, including a detour along the dreaded highway 36 so we could see if it was ride-able (it was not) we arrived in the not so scenic town of Red Bluff for lunch and a quick search of the Amtrak schedule to see if there was a station closer south away from the smoke at Redding. 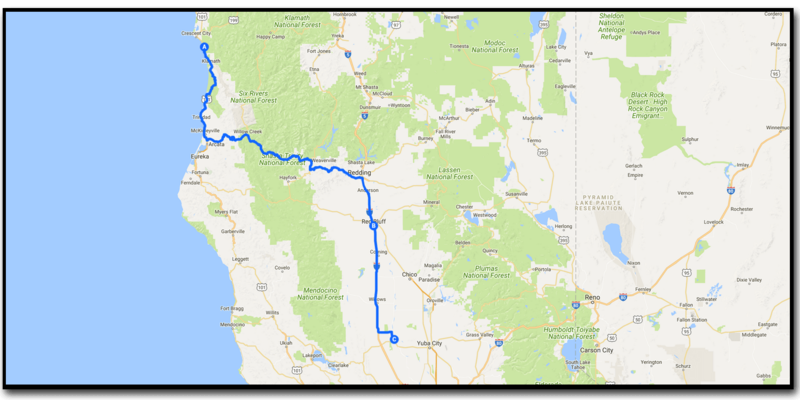 We settled on Sacramento and decided to start our ride from Davis, California as it’s only a few minutes from Sacramento and we could stash the car in a covered parking lot in Davis. Checking out Campendium, we found a campsite an hour away from Sacramento in Colusa, a highway junction to I80. The temperature has been hovering around 43 degrees celsius all around the California area for the last few days, with the National Weather Service declaring an extreme heat alert for the valley area which is very troubling to us to say the least. Tomorrow we will transit to Davis and hopefully begin our ride.